We’re proud to unveil our new TBAC “CB” Series Flash Hider. It is a mount for all TBAC Compact Brake (“CB”) series suppressors, including the 223CB, 30CB5, 30CB7, and 30CB9. 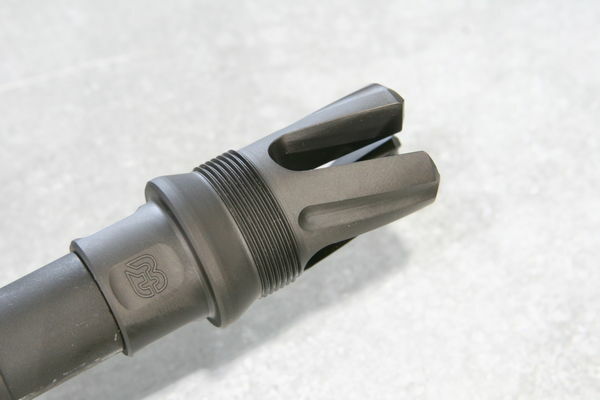 The TBAC CB Flash Hider provides excellent flash suppression characteristics when the suppressor is not mounted. The TBAC CB Flash Hider is ideal for .223, .308, or .300 Blackout, when your CB or BA series suppressor cannot be used for whatever reason. We came up with a novel design that has the flash-suppression advantages of distinct “tines” but does not “ring” when shot or impacted like other “tined” or “pronged” flash hiders on the market. Initially, we have the .223/5.56mm versions available with 1/2-28 threads and the .30 caliber version available with 5/8-24 threads. Other thread patterns will be available in the future.